In the various places I’ve lived in my life, I’ve experienced a variety of different air conditioning (and heating) units. Each of them has a different type of controller. Currently I have what are called “mini splits” where part of the unit is on the roof and the other part is mounted in the wall in each room of the house. The more rooms you have, the more units you have. With each unit, there is a small remote control for adjusting the settings. This isn’t a bad thing, but you can’t use a smart thermostat since there is no thermostat. Yes, some of the newer mini-split units can be connected to WiFi and Alexa or Google Home. That would require replacing the entire unit and would be very costly in the short term. Of course it could be more energy efficient and thus cost less in the long run. Luckily there is a device which can make the units “smart” without replacing them. It can also work with other types of units! Meet the Sensibo Sky Smart Air Conditioner Controller. It is a small unit that controls your HVAC system. Along with the small hardware device to control the HVAC system is an app installed on your mobile device. As you can see in the graphic at left, you have the ability to set your comfort zone. Once defined, the app will set the AC and heat as necessary to keep the temperature in that range. If you are one who loves to have voice control, it works with both Amazon Alexa and Google Home. Want to save on your electric bill? 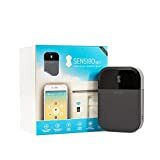 The Sensibo can even turn off your unit when it knows that you have left and it will turn it back on before you arrive. It does this via the GPS in your mobile device. While I’m not going to order one for myself right away, it is on my radar in the near future. My HVAC is one of the few things in my house that is not controllable by Alexa and I know I’ll want to change that. Yes, I do earn a small commission if you click on my links and buy something. No, I didn’t get anything for free for writing about this. If anything, I buy more stuff that I find when writing these posts.